Over 2,300 species of termites, most of them tropical, have been described by entomologists. In the U.S., we have only four groups of termites of economic importance: Subterranean, Dry wood, Damp wood, and Powderpost Termites. The Subterranean and Dry wood are the two types of termites that cause damage to buildings in Southern California. Termites live in the soil and must maintain contact with the ground or some other moisture source to survive. They build earthen tubes from the ground into the structure for protection from predators and to help maintain a moist environment. In some rare situations, if water and wood are available from a source other than the soil, subterranean termites can establish a colony with no ground contact. Termites live inside wood and do not make contact with soil. They get the moisture they need to live from humid air. For this reason, Dry wood termites are most common along humid coastal areas. Termites are social insects that live in highly organized colonies. Like many insects, termites have an egg stage, an immature stage, and an adult stage. There are three main types of adults colony members: reproductives, workers, and soldiers. When the colony is several years old and relatively large, it may produce another form of an adult termite called a "swarmer." Swarmers are the termite's way of sending out new kings and queens to start colonies. Swarmers are the most visible form of termites. These termites can be confused with ants that also swarm in the spring. Swarming ants, in contrast, have elbowed antennae, a narrow waist, and front wings that are longer than the back wings. Swarming termites have straight antennae, a thick waist, and wings that are the same length. Most subterranean termite control is done by applying either termiticides to the soil or termite monitoring bait stations in or around the structure. The goal is to establish a continuous insecticide barrier between the termite colony (usually in the soil) and wood in a building. Sometimes, there may be a secondary termite colony above the soil (in the roof or other areas with a constant moisture supply) that requires additional treatment. The termite baits do not leave a residual chemical in the soil. However, they can reduce and may eliminate a termite colony. While this method of controlling termites is very appealing because it does not require extensive site preparation such as drilling or trenching and extensive application of insecticide to the soil or structure, research is still ongoing to develop the most effective baits and delivery systems. All dry wood termite control methods can be categorized as either whole-structure or localized. A whole-structure treatment is defined as the simultaneous treatment of accessible and inaccessible infestations within a structure. A localized or spot treatment is more restrictive and is often applied to a single board or small group of boards. 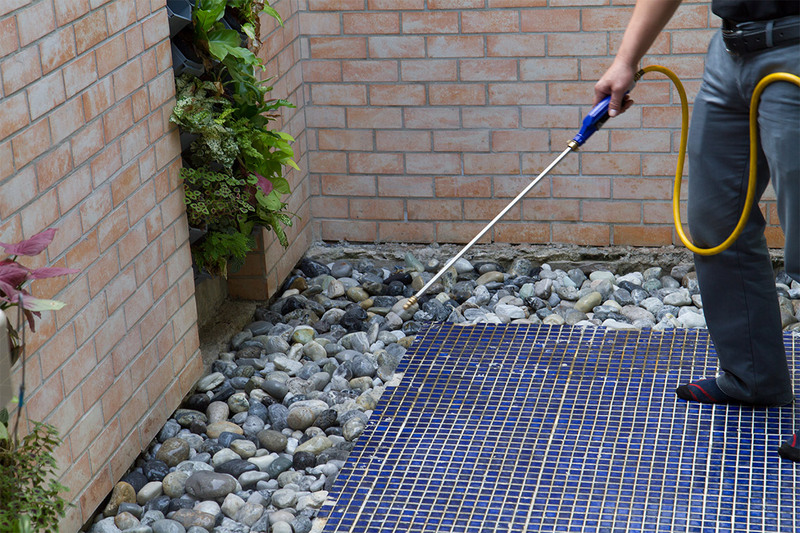 Homeowners are advised to know the distinction between whole-structure and spot treatments when deciding which method to select because all treatment methods are not equivalent. Whole-structure treatments have an advantage over spot treatments in that they are not detection dependent. This means whole-structure treatments, if applied properly, can eliminate all infestations, even hidden ones. With the unreliability of current detection methods, there is always some doubt as to the extent of dry wood termite colony boundaries within homes. Consequently, one can never be sure that all infestations have been treated. Fumigation is the process where insects are eliminated from a structure with the use of lethal gas. Fumigations are carried out using essentially one chemical: Sulfuryl Fluoride. This gas is odorless, colorless and leaves no residue. Therefore, prior to the fumigation, applicators introduce trace amounts of Chloropicrin. Chloropicrin (a warning agent) has a strong odor and will cause respiratory and eye irritation. 1. All people, pets, (including fish and/or fish tanks), and plants must be removed from the home. If it's living, take it out! 2. All food and medicines should be removed or sealed in special bags (your contractor will inform you about these fume-bags) according to the instructions from the fumigator. 3. Outside plants close to the structure should be cut back from the house to allow workers access to the walls of the building. The perimeter of the structure should be heavily watered to help prevent the fumigant from moving into the soil and affecting the plants. 4. Antennas, chimney caps, and weather vanes should be removed. 5. Fences without gates attached to the house may need to have some boards removed to allow the tarps to reach the ground. 6. Remove mattresses (except waterbeds) and pillows which are completely enveloped in waterproof covers or remove covers. All mattresses encased in permanent, waterproof coverings must be removed from the structure prior to the introduction of the fumigant, including infant mattresses. Detachable waterproof covers may be removed from the mattress or pillow in lieu of removing the object from the structure. Box springs are considered mattresses for the purposes of this determination. Due to a multitude of structural, environmental, and fumigation variations, there are no two fumigation jobs that are identical. The required dosage of Sulfuryl Fluoride is influenced by the temperature at the site, the length of exposure period, and the susceptibility of the pest to be controlled. Sulfuryl Fluoride is usually held in the structure for approximately 16-30 hours. Fumigation time is dependent upon the factors mentioned previously. The fumigator aerates the structure with use of fans and inlet devices for a minimum of 12 hours. A structure must be certified safe for re-entry by the licensee in charge of the fumigation. To ensure that even the owner or tenant cannot reenter a structure, the company is required to place a secondary lock on all outside doors that only the company can open. Certification is the final step of the fumigation. The fumigator must aerate a structure, so that the concentration of gas in the air is one (1) part per million (ppm) or less prior to allowing reentry. Leave the fumigated structure and get to fresh air. Immediately contact your physician. Let the fumigation company know what happened, and call your local agricultural commissioner to report the incident. If the company does not resolve a problem to your satisfaction, you can contact the Structural Pest Control Board by clicking the button below. The Board offers a complaint form to start the process.